Push notification is a special type of message that you can send to your readers on tablets and smartphones – if reader enables this way of communication during the installation of reader device. Short text message is accompanied by a name of your tablet magazine (or tablet application) and by your icon. Triobo Start allows you to send one message to all readers each month (“New edition of the XYZ magazine has been published”), the text can not be changed by the user. Triobo Professional allows to send 999 messages to all readers each month, the text can be freely modified. 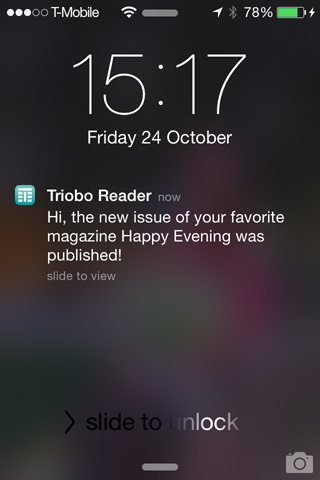 Thanks to Triobo you can send push notification to all readers, or – thanks to advanced Triobo Push Notification Assistant – for example only to readers who have not yet downloaded the current issue of the digital magazine. You can change and adjust the text of message according to your needs (Triobo Professional pricing program). ATTENTION: push notification must not contain advertising of third parties, you can expose youself to the risk of sanctions from Apple / Google (Android). For more information, read the rules of content providers Apple and Google.